BACK in 2002, the last Toyota Supra rolled off the production line. In the year’s since though, it has become a legend, a car loved by sports car enthusiasts and modders alike for its astounding performance capabilities. 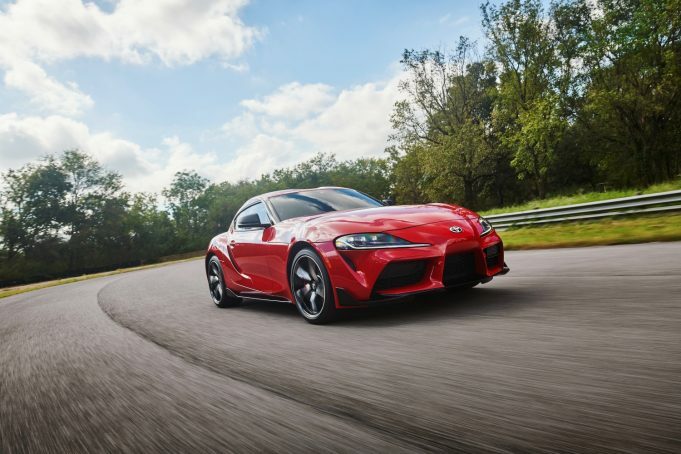 Now, seventeen years on, there’s a new Supra, with the worst kept secret in the automotive industry now a reality, following today’s launch of the all-new Toyota GR Supra, the fifth generation of Toyota’s legendary sports car. It’s the first global GR model to be produced by Toyota GAZOO Racing, and it has finally made its world debut at the North American International Auto Show in Detroit. Conceived as a sports car in its purest form, the new Toyota GR Supra builds on the heritage of Toyota’s past Supra generations and the 2000GT sports car with its classic layout of a front-mounted, straight-six engine driving the rear wheels. Driving enthusiasts can look forward to an exhilarating blend of power, agility and precision handling, achieved thanks to the car’s combination of a short wheelbase and wide track, light weight, low centre of gravity and highly rigid body. The 3.0-litre engine benefits from a twin-scroll turbocharger and produces 250kW and 500Nm of torque. Coupled to an eight-speed automatic transmission, it is characterised by smooth and powerful acceleration, with large amounts of torque available across the full range of engine speeds. Toyota GAZOO Racing was instrumental in honing the new sports car’s performance, working extensively on the famous Nürburgring Nordschleife and surrounding roads in Germany in order to achieve the most agile, stable and rewarding handling. Further testing was also carried out on roads around the world, including in Australia with chief engineer Tetsuya Tada. To be certain that the car delivered on its promise, Toyota president Akio Toyoda put it to the test at the Nürburgring in his role as a master driver before giving it the final green light. Mr Toyoda said he had developed his craft as a master driver by spending countless hours driving an old Supra at the Nürburgring. “Even though Toyota had no plans to make a new Supra, just like a lot of other diehard Supra fans around the world, I secretly wanted to make it happen,” he said. In Australia, the new Toyota GR Supra will be launched in late 2019 with approximately 300 cars available in the first 12 months. All vehicles will be built in Graz, Austria. The News Desk is the hub of Exhaust Notes Australia, where any of the team can post great news stories. MUCH improved. That's how we'd describe the new 2019 Kia Optima Si and its sporty counterpart, the Optima GT. Now although there's less choice in the model range, the mid-sized sedan has had an overhaul, complete with keener pricing. Exhaust Notes Australia is your destination point for the latest automotive news and reviews, on two wheels and four, as well as features and opinions. We'll bring you the latest motoring and motor sport news from around the globe - and we'll have some fun doing it - because nobody said we had to be serious all the time.